Shelby Brown and her husband Teg Gregory admit to being former yuppies who gave up high-income careers — Brown as a systems analyst and Gregory as an architect — for life on the farm. Married for almost nine years, Brown, 48, and Gregory, 59, are owners of Anala Goat Co. in Beasley. The company is named after Brown’s nanny, Anala Hebert. They live without satellite television and cell phones in a trailer on 18 acres. They have been raising, breeding, and selling dairy and meat goats for five years. They began in 1998 on Brown’s 130-year-old family homestead in the Panhandle town of Follett. “My grandparents spent their whole married life on this (Follett) farm. After they passed away, my mom and her siblings rented the place out for several years. When I found out they were going to sell it, I got so upset that Teg and I bought the place ourselves,” Brown said. She and Gregory moved there, but Brown soon returned to Houston in 1999 for employment. 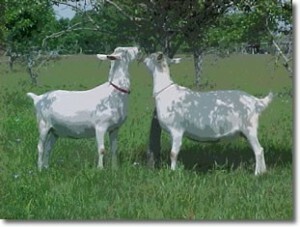 Gregory stayed in the Panhandle to work their fledgling goat herd. 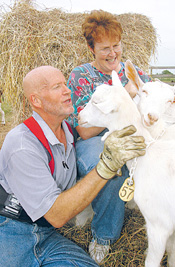 In 2000, they bought their Beasley farm, and he rejoined Brown, bringing their 40 goats with him. Their working roles now are reversed, with Brown tending to the goats while Gregory works full time in management at the Richmond/Rosenberg Wal-mart. While Anala Goat Co. is not quite at the monthly income level they made at the height of their yuppiehood, their calculations show that it is possible. Brown’s sense is that small farms are not a growing trend since they generally are not sustainable. Figures from the Fort Bend Extension Farm Service Agency show no trend toward smaller farms; 65 percent of the farms in the county are at least 50 acres. Brown said “hobby farms” comprising about 10 acres are popular where people can keep a horse and a few cows. “Goats are more profitable than cattle. They give you five times the return that cattle give, partially because goats have a shorter pregnancy of five months – cows have nine months — and often give birth to twins or triplets,” Gregory said. “We think about someday increasing the number of goats we have. But 100 is the most we can care for now.” Because their herd contains both dairy and meat goats, Brown and Gregory have added responsibilities. 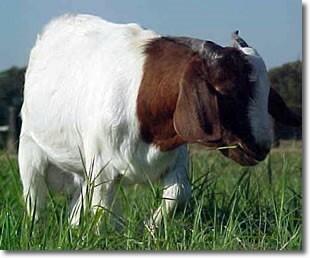 In the Houston area, the main customers for goat meat are people from Mexico and the Middle East. 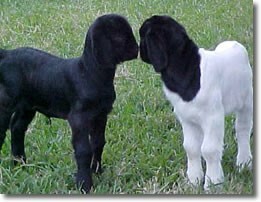 Most of the couple’s breeding stock sales are generated from the Web site, www.analagoatcompany.com. Anala meat goats are sold live. “Folks from Ohio and Kentucky are looking at goat farming as a more profitable alternative to traditional crops like tobacco,” said Gregory. “Texas has 80 percent of the goats in the United States. Demand has been up for goat meat since 1996 when government support for mohair lessened.” The federal government for 40 years had price support programs for wool and mohair to ensure an adequate supply to make soldiers’ uniforms. Those programs ended in 1994. However, subsequent legislation has provided reduced levels of support. Students who take Gregory’s goat farming course through Houston’s Leisure Learning Unlimited take a trip to the farm to see it in operation. “Students are typically astounded at seeing all the components of a working farm, and many refer others to the class. But what I have learned and try to share with my students is that goat farming is the most economically viable agricultural family enterprise and only in its infancy,” he said. Goats from Anala won Grand Champion at the last two years at the Houston Livestock Show and Rodeo, and have placed in the top 10 with their male goats in performance tests that measure their weight gain and conformation under controlled conditions to select desirable sires. Anala goats eat local alfalfa and corn, milo and cottonseed meal. They are fed no steroids or antibiotics. Each of the 100 goats on their farm has a name. “The goats that we’ve bottle-fed are very personable. But there is a great deal to learn about caring for any animal. Unfortunately, you get your practice on live animals,” Brown said. “Hopefully, you learn from your mistakes. You learn when to call a vet. We try not to assist during births. We want our animals to be the healthiest and most productive goats possible, because that translates into profitability.” The couple says they do not miss their life inside the Loop. “Our lives in the country let us commune with nature in ways we never knew. In the city, I had a dog and always had to be sure I walked him daily. Now we have six dogs who exercise themselves and are doing what they’re meant to do,” Gregory said. The dogs protect the herd from any predators. One of the livestock guardian dogs is Lady, a rescued Anatolian shepherd. “Lady is shy because she was mistreated early in her life. But I often find her in a pen with several of the goats, and I know she’s bonded with the goats and is always taking care of business,” Brown said. Brown and Gregory have learned that running a farm is high-maintenance. But they are planning and working toward their economic goals. They are adding a milking parlor and milk room to their barn to meet the Grade A license-requirements and are planning to add chickens. Brown plans to soon sell products like goats milk cheese to local markets under the name Earth Mother Farms. Brown’s friends have been calling her Earth Mother for years. “I’ve wanted to do this since high school. I was raised to believe that farming wasn’t an option for a woman. When we’d visit my grandparents’ farm, my brother and the boys got to help Grandpa in the field, but I was supposed to help Grandma in the house. So I put farming out of my mind. Then, you get to midlife and things surface. I allowed myself to think about it. By the beginning of this year, I was very ready to do this,” Brown said. Brown envisions sustainable agriculture as a way for young people to stay in small towns. “It’s a shame to see young people moving away. Teg and I hope to demonstrate small-scale operations like ours can make a sustainable profit so that there will be work for small farmers,” she said. Brown has two adult children from an earlier marriage, a son and daughter who live in the Houston area.